A bar or square is flat and baked in a square dish. 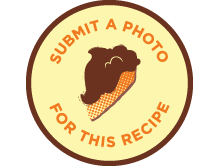 It has a texture between a cookie and a cake with an intense rich, sweet flavor. A high ratio of fat and sugar to flour provides these flavor and texture characteristics. Vegan bar and square recipes use egg replacers instead of eggs and solid fats instead of butter. Fruits become extra special when they're dehydrated. Many of their sugars slightly convert into acids during a subtle fermentation and their flavors become concentrated into a irresistible tartness with subtle sweetness accompanied by intense fruit flavor. This wildly complex cherry flavor is what I wanted to capture in this Raw Vegan Cherry Almond Bar recipe. Cherry notes are further enhanced by almond flour and agave syrup. Just a bit of lemon zest and salt to bring foundation to the whole flavor package. Finally, cacao nibs add a nice contrast featuring a slight bitterness and delectable crunch. Feel free to buy dehydrated cherries or dry your own if you have a food dehydrator. I recommend Bing cherries for these bars but you should be able to get great results with any other variety. I first became obsessed with crumb-topped bars when I discovered Whole Foods' caramelita bar, a decadent mixture of chocolate, caramel, pecans, sugar and butter. Definitely not vegan, and not all that good for you either. 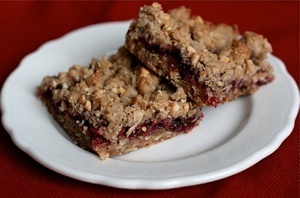 If made with real fruit, the jelly crumb bars at least hit one of the healthier food groups. This vegan version of the recipe takes advantage of the wonder that is Earth Balance and combines it with homemade cranberry jelly, dried cranberries and cashews. Peanut butter and maple syrup have this amazing relationship. I think they might be in love with each other. 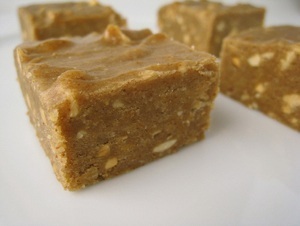 This Vegan Peanut Butter Maple Fudge recipe is really easy to make and you have the option of adding chocolate chips if you want to crank up the flavor/passion levels even more. This Vegan Chocolate Coconut Magic Bar recipe is quite possibly the only good thing I got from going to church as a youngster. Sundays were free-for-all sugar fests that kept the kids coming. 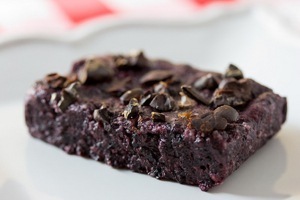 This vegan dessert in particular often inspired me to secretly infiltrate the church kitchen with ninja-like abilities so I could get to it first while the church service was still in session. Magic Bars are also known as Seven Layer Bars because they often involve seven alternating layers of things like walnuts, chocolate chips, peanut butter chips, butterscotch chips and shredded coconut that are bonded together with a liberal drizzling of condensed non-dairy milk. I opted to forego the peanut butter chips and butterscotch chips due to their near-impossible vegan availability and because they usually push the sweetness envelope a little too far. I then made up for their lack of flavors by opting for Golden Vegan Caramel Sauce or Easy Vegan Caramel Sauce instead of Vegan Condensed Non-dairy Milk in the binding department. The result is a sticky gooey mess of a great thing. 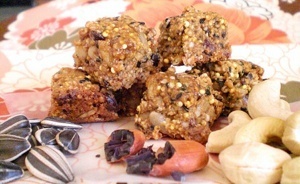 This Vegan Tropical Paradise Bar recipe makes perfect vegan energy bars for sporting events, a nutritious snack for people on the go or just for dessert. These gluten-free bars feature a cashew butter base that's sweetened with agave syrup, brown rice syrup then studded with pineapple chunks, macadamia nuts and shredded coconut. This Vegan Peanut Butter Bar recipe makes perfect vegan energy bars for sporting events, a nutritious snack for people on the go or simply just dessert. Peanut butter and chocolate is such a delectable flavor combination it may be banned in some countries. Add maple syrup and brown rice syrup to enhance chewiness and provide a complex sweetness profile and you had just better be careful walking around with these bars. This Vegan Cashew Crunch Bar recipe makes perfect vegan energy bars for sporting events, a nutritious snack for people on the go simply just dessert. These gluten-free bars offer a satisfying crunch as well as a nice chewy texture thanks to a cashew butter base which is sweetened with maple syrup and brown rice syrup, then studded with everything from hemp seeds to millet to crushed cacao nibs. 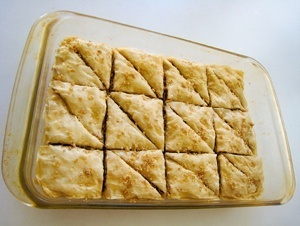 This Vegan Pecan Walnut Baklava recipe is much easier to make than it looks. It features layers of phyllo dough coated with Vegan Butter, layered with chopped pecans, walnuts and spices then drizzled with sweet syrup. Below are recipes for two different types of syrups to use depending on the availability of ingredients in your area.